Spend a day on Lago de Atitlán (Lake Atitlan), one of Guatemala's most beautiful lakes, on this sightseeing cruise with transportation from Guatemala City. This relaxing 8-hour excursion allows you to experience the exceptional beauty of Lago de Atitlán, a large lake with three volcanos on its southern shore. Starting in the town of Panajachel, cruise across the lake and admire its stunning scenery as you travel across the lake to the Tzutujil village of Santiago de Atitlán. Then return to Panajachel, where you’ll have time in town to browse Santander Street’s handicraft stalls, shops and restaurants. Discover the magnificence of Guatemala’s Lago de Atitlán (Lake Atitlan) on this relaxing sightseeing cruise! Depart from your hotel in Guatemala City and spend time on the water with your expert local guide, enjoying the lake's gorgeous volcanic surroundings! From Guatemala City, venture northwest to the town of Panajachel, located on Lago de Atitlán’s northeastern shore. Board your boat and head out on the water, marveling at the beautiful landscape. Lago de Atitlán originated from a massive eruption of Los Chocoyos volcano. Thousands of years later, smaller volcanoes rose out of the lake's waters, forming the lake’s spectacular setting. 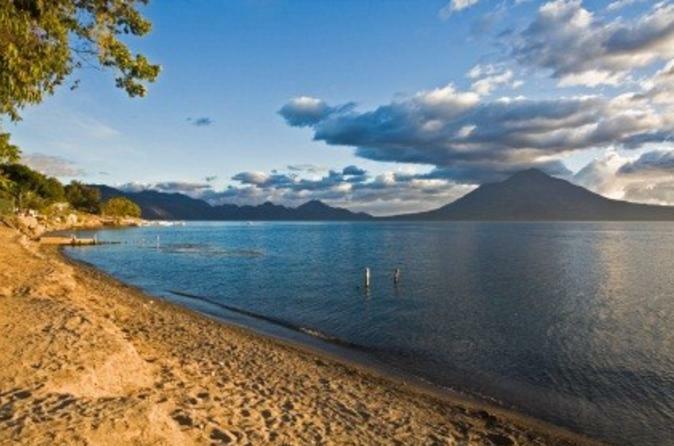 The three volcanoes – Volcan San Pedro, Volcan Atitlan and Volcan Toliman – all soar above 9,000 feet (3,000 meters) and create a dramatic vista that adds to the lake’s natural beauty. Cruise across the lake to Santiago de Atitlan, a colorful lakeside village. Go ashore here to see the village and observe how the local Tzutujil Maya people live. Walk down the main street lined with shops selling everything from oil paintings to woven baskets, and then re-board your boat for the cruise back to Panajachel. When you reach Panajachel, spend some time in town exploring Santander Street, the town’s main strip, filled with shops, craft stands and restaurants. Enjoy a delicious lunch at a nearby restaurant (own expense) and browse through the various shops and craft stalls before being transported back to your Guatemala City hotel.